The Spurs will be without LaMarcus Aldridge as he awaits answers for a minor heart arrhythmia. In that time, San Antonio could suffer in the matchups that matter. The Spurs became an institution because of Tim Duncan, but they remained one because of resource management. This is one area—among several—in which they have the rest of the league outclassed. San Antonio gets more out of every player than could possibly be expected. Would-be benchwarmers become meaningful members of a rotation. Second-round picks stick around and develop. Specialists play to their strengths and disguise their weaknesses. Stars stretch and cover as is necessary to make the team whole, ensuring that every other player can adhere comfortably to the systems in place. With Duncan’s retirement, this was to be the year that pushed that knack beyond its reasonable limits. The roster that succeeded him wasn’t much younger or more athletic, though it lacked Duncan’s uncanny defensive presence. Minutes that went to Duncan, David West, and Boris Diaw instead went to Pau Gasol, Dewayne Dedmon, and David Lee. Tony Parker and Manu Ginobili only grew another year older. Kawhi Leonard, the team’s undisputed defensive ace, would have even more responsibility with Duncan gone. All of this is true and yet the fallout never came. The ill-fated defense Duncan left behind is the best in the league. San Antonio’s offense is a few tenths of a point per 100 possessions removed from the top five. The Spurs, in defiance of all logic and explanation, are now tied with the Warriors for the best record in the Western Conference. This is a tremendous achievement, if one also mired in a deep uncertainty. On Saturday, the Spurs announced that LaMarcus Aldridge would be out indefinitely as he sought answers for a minor heart arrhythmia—an irregularity Aldridge is predisposed to by way of Wolff-Parkinson-White (WPW) syndrome. Aldridge was diagnosed with WPW in 2007. "Somebody says a heart, you start thinking a little more possible long-term kind of stuff, that's a little scary," Spurs coach Gregg Popovich said. "But you don't go there yet. They're doing tests. They did some tests [Saturday] and they're going to continue it on Monday. He's going to see some people on Monday, and based on what they do and see, we'll figure then what we're really looking at. We really don't know right now." “Scary” is the right word. Things can spiral quickly for a professional athlete when the heart and blood flow are involved, though for Aldridge we can only hope for something more manageable. Regardless, there is a potential for danger in this kind of ailment that makes torn ligaments and broken bones seem rudimentary by comparison. This is not a run-of-the-mill absence. Aldridge might yet get clearance and return to the court in good time, but there is no scheduled timetable when a player’s return hinges on heart testing and consultation. Where that leaves Aldridge, exactly, depends on the results of that testing. Where it leaves the Spurs is noticeably more vulnerable in his absence, however long that may be. San Antonio is deft at disguising its weaknesses—even when a star is unavailable. But the ripples of missing Aldridge, in particular, hurt most against the matchups that matter. The Atlantas of the world (whom San Antonio dispatched on Monday, 107–99) aren’t all that much of a problem. The Golden States and Houstons, on the other hand, become much less manageable without Aldridge around to shield the rotation. Aldridge gives Popovich much greater control over when to selectively deploy Gasol, Dedmon, and Lee. A team only has that luxury when it can lean on a few other players unconditionally. Leonard is one for the Spurs, Aldridge another. Neither can be played off the floor by a particular style or compromised by a specific matchup. They anchor the team as much with their minutes as with their play; it’s around their combined 66 minutes a game that all else begins to make sense. Pull either from the lineup and the Spurs lose their center of gravity. Lee became the starter in Aldridge’s absence, an exchange that leaves San Antonio at the mercy of teams that can target Lee to defend in space. There is less tailoring, too, as to when Gasol sees the floor; he will have to see some regular time in unfavorable matchups because Aldridge is no longer there as a catch-all. On the nights where Dedmon isn’t quite settled (as was the case against the Rockets earlier this month), Popovich will have little alternative but to bear it. That San Antonio has actually been better this season with Aldridge off the floor than on it speaks to the freedom he provides. Popovich could adjust his rotation to ensure that Gasol, Dedmon, and Lee saw only the lowest-risk minutes (and combinations) possible on a given night—an impossibility now that the rotation has cinched up with Aldridge out. San Antonio has played such tremendous defense this season that it should be able to get by on most nights. Dedmon is a genuine asset there, while Gasol and Lee aren’t as dead in the water as they might seem. This is a team that positions itself well and scrambles with the best of them; rotations are so crisp and energetic that the mayhem of a defensive shuffle serves as a functional backdrop. Still, there are costs to these exchanges, no matter how expertly the Spurs cushion what they can. Leonard will be pushed to his limits on offense in a way that taxes his defense. Even the best coverage San Antonio has to offer will be strained against quicker opponents. Losing an easily accessible scorer like Aldridge undercuts the Spurs in their ability to apply consistent pressure with their own offense. Shooters like Danny Green and Davis Bertans will be challenged at the arc and made to create beyond what is comfortable. There are layers to missing a player like Aldridge that, with their collective weight, can chip away at a standing this improbable. The Spurs’ success defies its personnel. 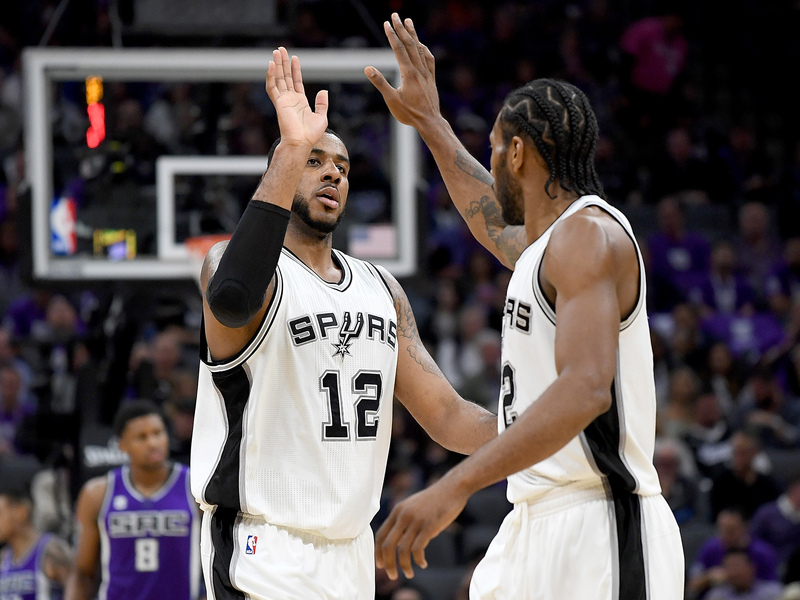 Aldridge has the kind of stable, all-around game to make that possible—to insulate what works and shelter what doesn’t, all so that more Spurs can be their best selves.